Childhood eye care in much of Africa is not comprehensive in nature; in many settings there were well trained paediatric ophthalmologists working in isolation while in other settings there were “low vision technicians” without any link to the eye care or education networks. 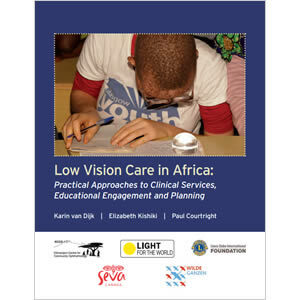 Published by the Kilimanjaro Centre for Community Ophthalmology (KCCO), this manual is a practical guide on how to plan and implement low vision services in the wide variety of African contexts. It covers clinical low vision services, linking clinical services with educational services, and planning and monitoring low vision services. It has been developed with the providers and planners in mind; it is an attempt to provide those individuals at hospitals, training schools, and other settings with the knowledge and understanding of implementing low vision within an overall VISION 2020 programme. While the focus is primarily on children, this manual can also assist programmes to manage the low vision needs of adults. Although, the primary audience is African, the new Spanish and Portuguese editions were translated with the help of IAPB Latin America and ORBIS who found the manual also relevant for Latin America.